I have a spreadsheet in which I want to display a number as "+12.345%" if it's below 2 (below +100%), and as "x1.234" if it's above 2. 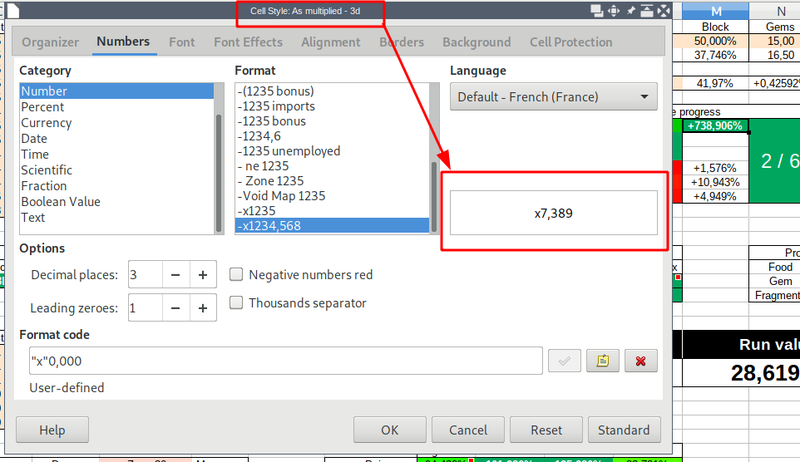 My cells have the default style, and manually I specified that makes them displayed as "+12.345%". I then have conditional formatting settings so that if the cells' values are above 2, it changes color and format. Now notice that this new style is correctly applied when a value is above 2, since it changes the color and background. But the format remains the same. So what's causing this and how can I fix it so that conditional formatting will actually change the cells' format? You applied a hard attribute (here number format) that takes precedence over and thus overrides the corresponding conditional format's attribute in every case. Format the cell with the Default language's General number format instead and use a conditional format with two conditions, <=2 to apply a style with "+"0.000% number format and >2 to apply a style with "x"0.000 number format.